Preheat the oven to 350°. In a large bowl, toss the buttercup and butternut squash with 2 tablespoons of the olive oil and 2 tablespoons of the brown sugar. Season with salt and pepper. Spread the squash out on a large rimmed nonstick baking sheet. Add the acorn and delicata squash to the large bowl. Toss with the remaining 2 tablespoons each of olive oil and brown sugar and season with salt and pepper. Spread the squash out on another large rimmed baking sheet. Roast the squash for about 1 hour, turning once, until tender and lightly caramelized in spots. 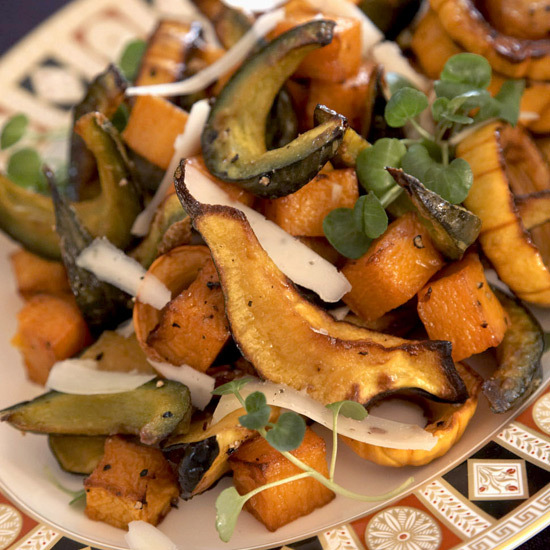 Arrange the squash on a large platter and drizzle with the maple syrup. The roasted squash and sage cream can be refrigerated separately overnight. Reheat in a 350° oven, loosely covered with foil.